It is a dark time in the universe. Planet after planet is falling to an unholy army of Necromongers--conquering warriors who offer ravaged worlds a simple choice--convert or die. Those who refuse their rule hope in vain for someone or something that will slow the spread of Necromongers. But rebels are short-lived and saviors, it seems, are in short supply. When things get bad, weary survivors turn to myths for comfort--murmured propheciesm, vain hopes, legends of good vanquishing evil. But good isn't always the antidote to evil and legends can be wrong. Sometimes the only way to stop evil is not with good--but with another kind of evil. 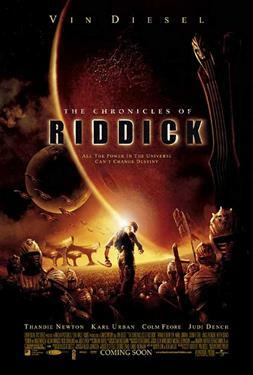 So an unlikely figure is summoned from exile and asked to join the fight: Riddick, who couldn't care less who's in charge of the universe, just as long as he's left along. Since leaving a god-forgotten (and creature-ridden) planet in the Tauras system five years ago, the wanted fugitive hasn't looked back. Most of the time has been spent evading capture and ghosting whatever mercenaries are on his tail. To him, it's all the same, apocalype or no--this one-man army is interested only in saving his own life. Get in his way and his gladly take yours. But something has been set in motion, and the coming confrontation propels Riddick into a series of epic, winner-take-all battles: from an idyllic, multicultural civilizaton under seige; to a subterranean prison carved beneath the surface of a hellish, volcanic planet; and finally, aboard the massive baroque Necro motherhship and the seat of power in their black empire--the Basilica. In the final battle, it is foretold that the fate of all may depend upon the destiny of on Furyan.